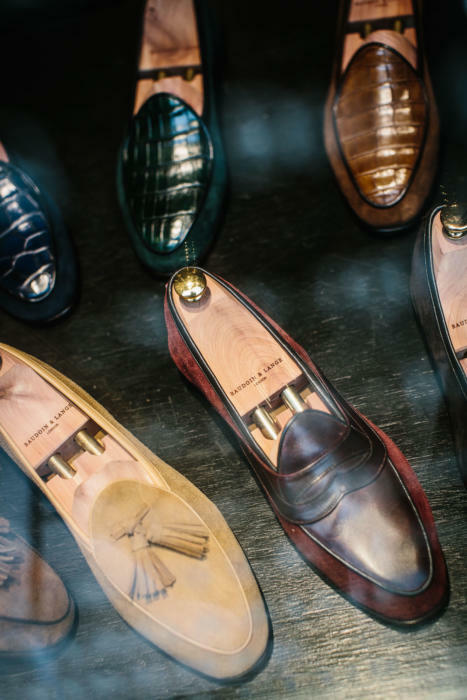 A few menswear shoemakers have expanded into women’s shoes in recent years. These shoes will generally be a lot better made than the other women’s shoes in the market, and not necessarily more expensive (given the designer mark ups on the latter). But there are two challenges. 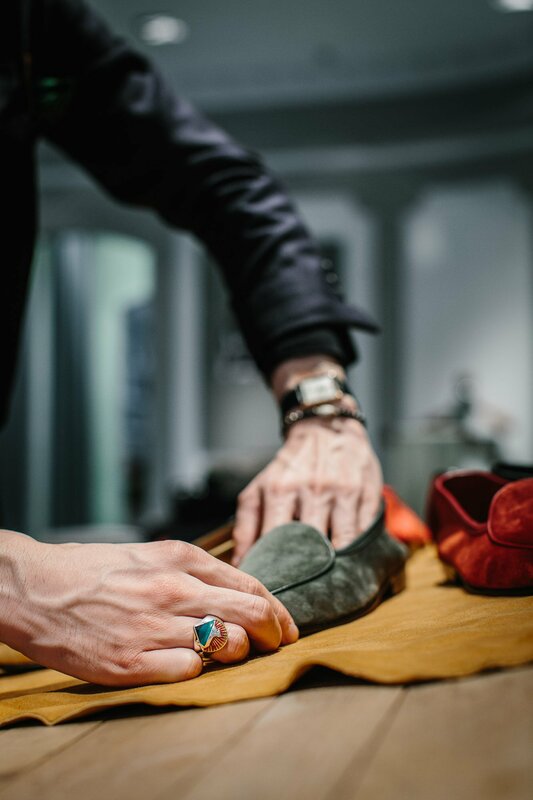 One is getting a woman to pay a designer price for a non-designer shoe - to appreciate the quality and to look after it well enough so that the quality comes through. And the second challenge is style. Men’s-style brogues may be fashionable at the moment, but they won’t be forever. Paying that much for a fashion item is tough. Baudoin & Lange don’t have that second issue. Their new women’s shoes (launched at the current Savile Row pop-up) are very similar in style to women’s flats, or ballet shoes. They are already a staple of the female wardrobe. Allan and Bo just have to convince women to pay more money for better quality. That quality is a considerable. As a man you rarely realise how spoilt you are with shoe construction until you look at a ballet shoe. 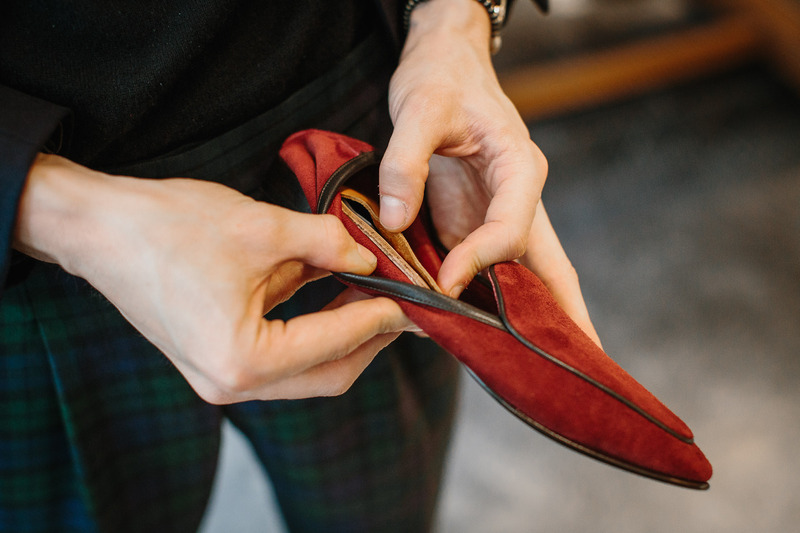 It usually has nothing between the thin leather sole and the leather sock inside except a cloth-covered shank and a little bit of foam (which quickly compresses). 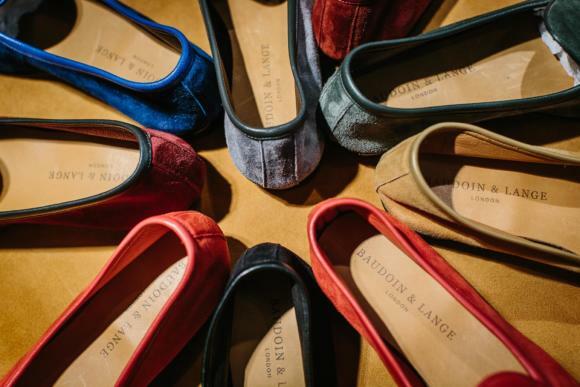 A Baudoin & Lange Sagan is a very simple men’s shoe, but it adds a proper leather insole to this list, quality foam padding and cork under that padding. The upper is obviously also much higher quality, both looking better over time and being more comfortable. 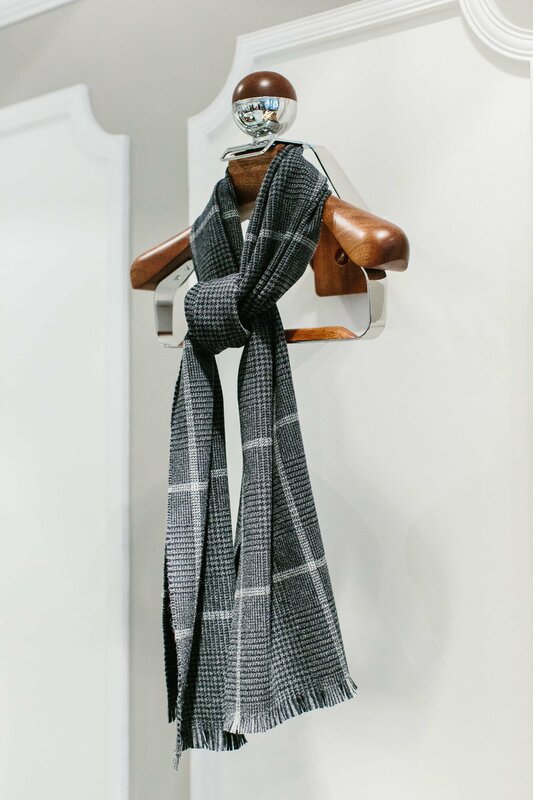 I saw one stylish woman try on a pair of Sagans while waiting for her husband in the pop-up shop on Sunday, and the quality difference was immediately obvious. Only the first issue, of paying £305 for a ballet shoe, remains. Elsewhere in the pop-up shop (now in Week 2 - see schedule here), Luca Faloni has been as popular as expected. 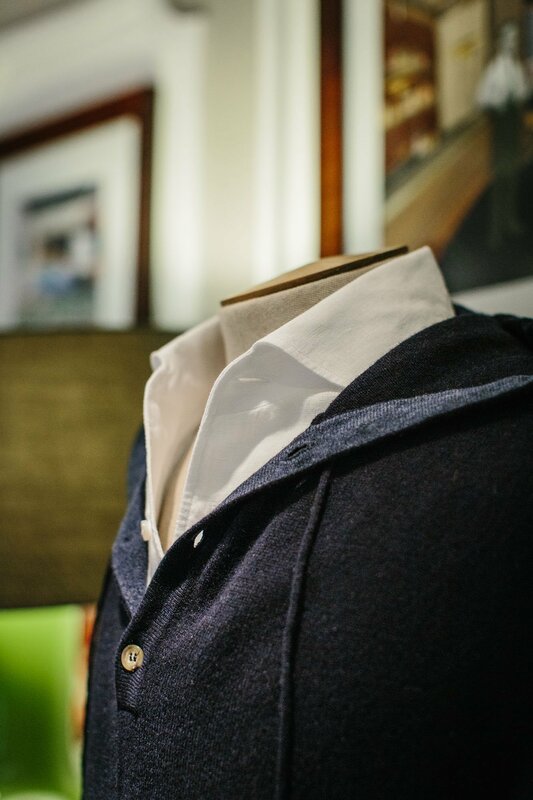 His formula of high-quality cashmere in classic styles, and a good price, is an easy one to buy into. Interestingly though, it has been his brushed-cotton shirts and buttoned hoodies (above) that have gone down particularly well so far. And Mantas Lesauskas, founder of Honorific, deserves a big thank you for the valet stands he has contributed to the shop. Not only does the pop-up have on display Mantas’s original valet stand (in steel and mahogany) and my personal stand (in brass and walnut), but the walls are decorated with his latest offering - the wall-mounted valet (above). This model retains the most attractive parts of the stand - the hanger and trouser bar - but is a lot cheaper for being smaller. Although still expensive at £1,440, it’s a lot less than the classic stand’s £3,300. Do pop into the pop-up if you have time this week. It’s open until Sunday, before starting again next Wednesday with the second round of brands: The Armoury, The Rake and Begg & Co.
You can follow the discussion on Baudoin & Lange women’s shoes (and Luca Faloni, and Honorific) by entering your email address in the box below. You will then receive an email every time a new comment is added. These will also contain a link to a page where you can stop the alerts, and remove all of your related data from the site. I love my Sagan loafer, but I really wish they would update their range with different widths. I understand that it’s an unconstructed shoe which adapts to a lot of feet, more so than probably any shoe or slipper. However, my pair of 45s are slighlty narrow across the foot, and while the 46s are too big in the heel and toe, they’re just perfect in terms if widths. I’m sure we’re a minority, but I’ve spoken to a few other Sagan owners that agree their fit would be better with a slightly wider shoe. That being said, they’re a work of art and damn comfortable. I’ll be moving mine to the office to wear indoors when heavy snowfall starts in Sweden and snowboots are required. The ladies range looks wonderfull, I’m cerntainly tempted to get a pair for my wife. Same problem for me, the end of the shoe is too narrow which compresses toes slightly. The shoe is soft so it stretches but would I want to pay 305 for a shoe that doesn’t fit, sad to say no. That is marvelous news, very interesting indeed. Here I was, merely hoping for a slightly wider fit, which I imagined would also let it end up slighty higher up on my foot. It sounds like this “Sagan 2.0” will be a little more shoe and a little less slipper? I appreciate the craft behind the Sagan and I love the light unlined feeling, so seeing this updated slightly more rugged version will be interesting. I’m sure there is room for both in my life. Hi JB, indeed they will be more like a shoe all around ! Thanks for you support ! The last photo of the sand loafers looks great. Would you prefer it with string or with tassel for this colour? When I popped in I last week I thought the colour pallette was great. I’m very tempted the get another pair in the same green skin is used in the ladies collection. My girlfriend always wears ballet flats but she loves these. Is nothing sacred in a man’s wardrobe anymore! Oh yes. We’re so desperate for sales that we’ve moved our sale period from January to November. Do you perhaps know what the armoury is showcasing next week? Will they bring their new shoe range and some armoury products(denim, chino….etc) like last time? Thank you for including these lovely ladies shoes Simon. As I woman I find it increasingly diffucult to not just find good quality shoes (and clothes for that matter), but also shoes that aren’t overly designed or embellished. I’m forever envious of my husband’s simple, well made good quality things. I know your website is dedicated to men’s wardrobes and style, but I do very much appreciate the occasional mention of manfacturers of proper women’s clothes and shoes. It is because of permanent style that I have recently purchased my first pair of Crockett & Jones boots (the Bonny chelsea boots). Thank you Grace, nice to hear! Great article Simon! Can’t wait to grab myself a pair. £305 is a great price considering I paid £540 for a pair of Gucci horsebit loafers that gave my foot blisters everywhere! Also, the shoe that touted as most ‘comfortable’ ballerina flat, the Chloe scalloped ballerina comes in at a steep £295 for what I can only describe as a peice of cardboard with sad excuse of a rubber heel. I’m sorry to name names but I wish women recognized quality more and didn’t just fall for simple brands and their ridiculous marketing. I’ve seen B&L’s men’s loafers and I can’t wait to finally have my own pair. you say that a few menswear shoemakers have expanded into women’s shoes in recent years – apart from C&J, which others did you have in mind? I believe Carmina does a line as well, as does EG. Great news for the ladies that more and more quality brands are expanding into women’s goods. But how does B&L’s Womens version differ from the mens one? Is it solely in colour and sizing, or also in construction? Hi Felix, the construction is the same as for men, that means they bear the same engineered insoles that we use for men, these allow us to incorporate cork and breathable orthopedic padding under the footbed while keeping the last depth and overall finesse of the shoe optimal. As I know we are the only ones doing so, it is a very tricky production technique around which our whole production line is built. The best is always to try them on to realise it ! These guys have copied exactly, with none of their own imagination, this brand that has been around forever: https://belgianshoes.com. Shouldn’t your site be promoting brands that want to put their own imprint on something rather directly copying another brand? Don’t you care about this? I do David, and I’m afraid I disagree. The make, quality and subtleties of design are all different to the traditional Belgian loafer. Others have merely copied; B&L have not. Hey Simon do you have any recommendations for driving mocs with soles which you can change/replace rubber in the heels. I like the design and structure (more casual than b&l Sagans and with more structure which makes them more comfortable) but I dislike the rubber nubs.